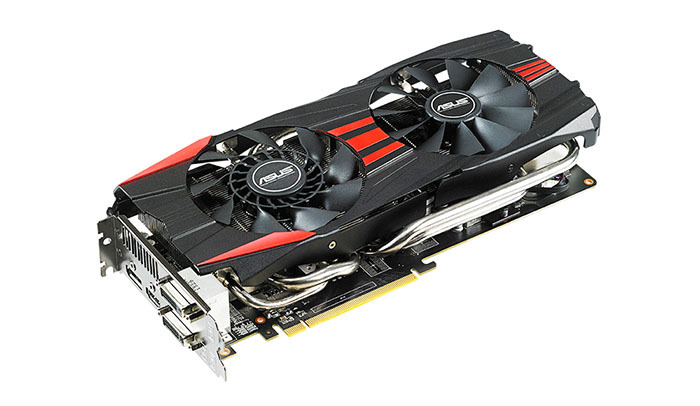 AMD launched a number of new graphics cards on Tuesday. Now branded the R-series but using technology that's very much from the existing Radeon HD 7000 range, the standout feature of the R9 280X, R9 270X and R7 260X is pricing that, at the moment, is more attractive than equivalent Nvidia GPUs. Take the Radeon R9 280X as a case in point. The architecture is practically identical to the Radeon HD 7970 GHz Edition, translating to very good gaming performance at monitor resolutions as high as 2,560x1,440. Where this new Radeon scores big is price, as stock-clocked cards are available for £230, with partner-overclocked models running closer to £275. Asus is one big name that's definitely not going to pass up on this new Radeon jamboree. The Taiwanese giant has multiple R9 280X in its arsenal, but the most interesting, from an enthusiast's point of view, remains the DirectCU II TOP model. It just so happens we have one for review today. Asus is of the belief that effective cooling of high-end GPUs requires a truly massive heatsink coupled to two large fans. The card is big, really big, measuring 287mm long and almost 150mm high, thus making it the largest single-GPU Radeon to come under our scrutiny. Just take a look at the length of the PCIe connector and backplate in relation to the heatsink for confirmation of its gargantuan size. This DirectCU II cooler is repurposed from the Radeon HD 7970/GeForce GTX 780 cards, and that's a good thing because it has been proven to work very well. Five variable-thickness heatpipes jut out from the core - four at the bottom, one at the top - and the extra size of the cooler enables Asus to cram in more aluminium fins than we've seen on cards other than EVGA or MSI. Indeed, Asus boldly claims that the total heat dissipation surface area is 2.2x greater than that of a reference card. The twin fans are the same size, 10cm, but are different in appearance. Asus believes that employing more blades on the right-hand fan helps with acoustics when under load. Overall build quality is exemplary, too. Power is sourced by the usual combination of one 8-pin and one 6-pin connector, located on the far side, though on this card the connectors are rotated by 180° - they clip in 'upside-down', making installation easier. There are also two visual indicators directly below the connectors, signifying, via green LEDs, that the power delivery is as expected. Asus, however, foregoes the rear-mounted metal holding plate that's present on the GTX 780 version of this card. Underneath, Asus upgrades the standard R9 280X GPU's power delivery from five to eight phases, helpful when overclocking, as each phase can deliver 45A. Do a little maths and the PWMs can handle over 400W with a core voltage of 1.2V. It's no surprise, therefore, to learn the DirectCU II TOP has faster-than-reference speeds from the get-go. Shipping at 1,070MHz core and 6,400MHz for the 3GB of GDDR5 memory, up from the default 1,000/6,000MHz, it is reasonable to assume this behemoth will be at least five per cent faster than a generic card. Extra card width is clearly on show when looking at the backplate. Asus leaves the outputs standard, though it's worth noting that firmware updates to the R9 280X cards means that the two dual-link DVI and HDMI outputs can be used concurrently when powering three monitors. The inevitable price to pay for engineering beyond the reference card is a £50 premium over the cheapest R9 280X models. Coming in at £275, or Nvidia GeForce GTX 770 money, the DirectCU II TOP will need to excel in every area for it to be recommended. Let's now see if it can do just that.